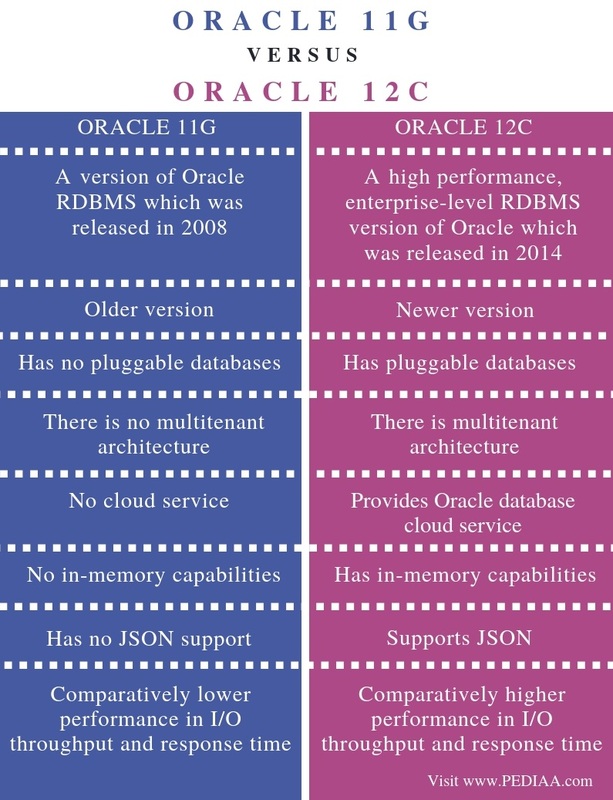 The main difference between Oracle 11g and 12c is that the Oracle 11g is an older version of Oracle RDBMS and has no pluggable databases while Oracle 12c is a newer version designed for the cloud and has pluggable databases. Moreover, Oracle 12c allows running multiple databases on the same hardware while maintaining the security and isolation among the databases. DBMS (Database Management System) is a software that helps to create and manage databases easily and efficiently. An RDBMS is a DBMS that follows the relational model. In other words, these systems use a relational model to store data. They store data in tables, which are connected to each other. Oracle is one such RDBMS. There are various versions in Oracle, Oracle 11g and 12c are two of them. Oracle 11g is an RDBMS that is easy to install, manage and develop. It consists of an intuitive, browser-based interface to manage databases. Users can perform multiple operations using Oracle 11g. They can create tables, views, and other database objects. It is also possible to import, export and view table data. The users can write SQL queries and execute them to perform operations on the database objects. Also, in this, it is possible to generate reports. Moreover, there are two versions in Oracle 11g; they are the Oracle Database 11g Release 1 and Oracle Database 12g Release 2. The Release 1 has Marquee features such as Active Data Guard, Secure Files, and Exadata. The release 2 has Marquee features such as Edition-Based Redefinition, Data Reduction, Hybrid Columnar Compression, Cluster File System, Golden Gate Replication, and, Database Appliance. Oracle 12c is a high-performance, enterprise-level RDBMS. It is Oracle’s first RDBMS designed for the cloud. The Oracle Database 12c Release 1 provides in-memory column store. It is an optional add-on that provides in-memory capabilities. The in-memory option provides real-time analysis. Oracle 12c also supports Native JSON and SQL pattern matching. One major advantage of this Oracle version is that it enables the users to transit to the cloud more easily. Moreover, it follows a multitenant architecture. And, this architecture simplifies the consolidation without any changes to the applications. Also, it provides pluggable databases to support rapid provisioning and portability. Therefore, Oracle 12c is suitable for self-service provisioning and database as a service. Oracle 12c release 2 has Native sharding, zero data loss recovery appliance, and Exadata Cloud Service. Oracle 11g is a version of Oracle RDBMS released in 2008. Oracle 12g is a high performance, enterprise-level RDBMS version of Oracle released in 2014. Oracle 11g is the older version while Oracle 12g is the newest version. The main difference between Oracle 11g and 12c is that the Oracle 11g has no pluggable databases while Oracle 12c has pluggable databases. Moreover, Oracle 12c allows running multiple databases on the same hardware while maintaining the security and isolation among the databases. Another important difference between Oracle 11g and 12c is that, in Oracle 11g, there is no multitenant architecture. But, in contrast, there is multitenant architecture in Oracle 12c. Cloud service is also a major difference between Oracle 11g and 12c. Oracle 11g does not have cloud support while Oracle 12c provides Oracle database cloud service. Moreover, Oracle 11g does not provide in-memory capabilities. However, Oracle 12c provides in-memory capabilities. JSON support is another difference between Oracle 11g and 12c. Oracle 11g has no JSON support whereas Oracle 12c supports the JSON. Furthermore, Oracle 12c provides more performance in I/O throughput and response time than Oracle 11g. We can consider this too as a difference between Oracle 11g and 12c. Oracle 11g and 12c are two versions of Oracle. In summary, the main difference between Oracle 11g and 12c is that the Oracle 11g is an older version and has no pluggable databases while Oracle 12c is a newer version and has pluggable databases. Moreover, Oracle 12c allows running multiple databases on the same hardware while maintaining the security and isolation among the databases. 1. “What Is Oracle Database 12c? – Definition from WhatIs.com.” SearchOracle, Available here. 2. “Oracle Database.” Wikipedia, Wikimedia Foundation, 25 Oct. 2018, Available here.